In this picture taken through bullet proof glass, mass killer Anders Behring Breivik looks on as he arrives for his trial in room 250 of Oslo's central court on June 21, 2012. 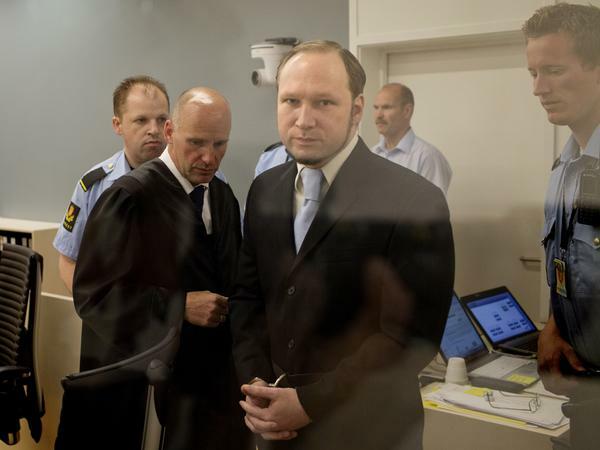 "July 22 was an inferno of violence," Breivik's defense lawyer Geir Lippestad told the court as he asked that his client be acquitted, according to The Associated Press. "But we must also look at how he carried out the attacks to see whether it was violence in itself or radical politics that was the cause." "He realized that it is wrong to kill, but he chose to kill. That's what terrorists do," Lippestad said. "The ends justify the means. You don't understand this if you don't understand the culture of right-wing extremists." "That little, safe Norway would be hit by such a terror attack is almost impossible to understand," Lippestad said, according to the AP, adding that it helped explain why psychiatric experts reached different conclusions about Breivik's mental state. Lippestad tried to prove to the court that Breivik's claims of being a resistance fighter in a struggle to protect Norway and Europe from being colonized by Muslims are not delusional but part of a political view shared by other right-wing extremists. The day before, prosecutors had argued that the 10-week trial had proved that Breivik was psychotic and needed to be hospitalized instead of imprisoned. "In our opinion, it is worse that a psychotic person is sentenced to preventive detention than a nonpsychotic person is sentenced to compulsory mental health care," Svein Holden, one of the prosecutors, told the court, according to The New York Times. As Holden concluded his statement in the courtroom, Breivik smiled broadly, and as he was led out of the courtroom, he repeated the fist-pumping gesture that he affected in the first few days of the trial. The five-judge panel is expected to make a ruling in July or August.